Intro: Welcome to the Cookery by the Book podcast with Suzy Chase. She's just a home cook in New York City, sitting at her dining room table, talking the cookbook authors. Sarah Rich: My name is Sarah Rich and my husband Evan and I have just come out with our new cookbook called Rich Table. Suzy Chase: It was so nice to meet you at High Street on Hudson, Wednesday night, and taste dishes out of this cookbook. I want to kick things off by talking about some of the incredible dishes I had. First, let's start with one of the snacks. The cranberry bean dip on page 66. Describe this dish and what are cranberry beans? Sarah Rich: Cranberry beans are a fresh shelling bean, and they're really, really delicious, and we love to use them at Rich Table. One of the things that we're really lucky to have at Rich Table is, being in San Francisco, we have these great farmers markets and we got so much great produce and we can change the menu constantly. With the cranberry bean dip, we wanted to make something that was sort of like ... similar to kind of a hummus because that's one of our favorite things to eat, but a little bit different, and we use cranberry beans instead, because they have kind of that same rich creaminess, but just something a little bit different. Suzy Chase: And then talk a little bit about the plancha bread. Is that how you pronounce it? Sarah Rich: Okay. Yeah. Yes, plancha bread. We call it that. We have something in our kitchen called a plancha, which is basically just like a flat top or a griddle. We make this bread. It's really, really easy bread to make, and we roll it out into little balls and then roll that out into a nice, long, sort of oval shape and grill it right on the plancha, so it gets ... it has a nice sort of yeasty flavor. It's got some whole wheat in it, so it's got a little nice texture to it, nice chewiness, but then cooking it right on the flattop or the griddle gives it a really wonderful flavor and a little crispness to the outside. It's kind of like a pizza dough but instead of puffing it up in the oven, we just grill it flat on the griddle. We serve the cranberry bean dip with that, and then we have some fresh wax beans or you can use runner beans or green beans or broad beans. Whatever sort of pole beans like that. Slice it up nice and thinly, dress it with a little bit of our [inaudible 00:02:35] vinaigrette and some padron peppers that we've charred, which gives it a little spiciness. Suzy Chase: Yeah. It was kind of a fresh take on the pita and Hummus. Sarah Rich: Yeah. Exactly. Exactly. A very California, Rich Table take on that. Suzy Chase: By the way, my husband said if we lived in California, we'd go here once a week. Sarah Rich: Oh, good. Well that's what we want. We do say that about Rich Table. We wanted to be the kind place where you could go for a special occasion where you could go every Tuesday night for a grilled steak and pasta. Suzy Chase: I wish you'd come back to New York City, but anyway, that's beside the point. And I digress. Next I had the sprouted quinoa cakes with summer squash and chevre on page 178. Described this dish. Sarah Rich: We really try to have a lot of vegetarian options. The way our menu is broken down, we've got our bite section, which are really tiny little things to eat, snacks to have when you start your meal, appetizers. We have pastas and then we have our main courses, of course. We always have a steak, we always have some sort of fish or something like that, but we like to also have a nice vegetarian option and we want to do something beyond just like sauteed vegetables on a plate, and so this is an example of that. You've got the sprouted quinoa. Sprouting it kind of gives it ... softens it a little bit and helps it, actually, your body digest it a little bit easier, and then we make the cakes out of that and grill them, again, on the plancha. The chev goes really nicely with that. Suzy Chase: For my main course, I ordered the buttermilk poached chicken that's on page 205. I don't think I've ever had poached chicken at a restaurant. I cannot tell you how buttery and moist it was. Describe this dish. Sarah Rich: Exactly. My husband and I met at a restaurant called Bouley, which is downtown in Tribeca, and this was actually something ... a technique that we learned there. Chicken on the menu ... even Evan's mom, she ordered the same dish. She came to the dinner as well and she said, "I never order chicken when I go out to eat. ", and I think a lot of people feel that way because they're like, "Chicken. I make chicken all the time at home. ", but this is a way to make chicken. It makes it, just like you said, very buttery. It's a beautiful texture. We take the breast and put it in a bag and add buttermilk, season it really nicely, and then you just poach it in a water bath really slowly and gently so that, that buttermilk, it's its own little warm bath for the chicken. It kind of permeates the meat, it gets that ... buttermilk has kind of a tangy saltiness to it, a richness to it that gets into the meat, makes it super tender. Then cooking it slowly like that just keeps it really, really nice and makes it buttery, like you said. Suzy Chase: The salted caramel panna cotta on page 240 was interesting and I thought the coffee was all the way through, but it was just the crumble that was the coffee. Sarah Rich: Yes. Yeah. I like ... with my desserts, texture is very important to me, and also I actually have a savory background. I make the desserts at Rich Table, but the majority of my training is on the savory side of things. I come to desserts from that perspective. For me, I think a lot of people make desserts that are overly sweet, really heavy and I like a little saltiness to what I do. Obviously, a little salt in the caramel panna cotta, and then the crunch from the coffee crumble, which gives ... a lot of people are afraid of bitter as a flavor, but I think bitter is a very useful tool, so I add a little bit of bitterness to kind of counter the sweetness of the caramel and then the whip cream kind of balances everything out and adds a little nice smooth texture as well. Suzy Chase: Last but not least. I don't drink coffee, I don't even like coffee, but your Rich Table coffee, knocked my socks off. The recipe's on page 278. Talk about this cup of deliciousness. Sarah Rich: When you come to San Francisco, one of the things that you do as a tourist, is you go to The Buena Vista Cafe, which is down near fisherman's wharf, and they make a classic Irish coffee and they do a fantastic job of it. We wanted to sort of put our own spin on that classic San Francisco cocktail. We use Fernet Branca, which is an Amaro, which is very, very popular out in San Francisco. In fact, when you are a line cook working in the city, that is what you drink at the end of a shift. Which, coming from New York, we had ... we didn't really know that, and so that was something that we learned being out in San Francisco. We included that in our Irish coffee and then we also add a little pistachio cream to it, which you can't .... pistachio and coffee go really wonderfully together and it's just such a sort of rich, luxurious ingredient to add that makes it really delicious. Nobody doesn't like the Rich coffee. Suzy Chase: I could literally drink this every day. It would make me a coffee drinker. Sarah Rich: Yeah, yeah. We had ... that is a common opinion. My mom is not a coffee drinker. She loves the Rich coffee. Evan's parents don't drink coffee too much. They love it. Anybody who has it loves the Rich coffee. Suzy Chase: You're traveling to a few different cities cooking out of this cookbook. How is it cooking in a different kitchen? Does it throw off your flow? Sarah Rich: For sure. That is always a difficult part of it because you're in your own kitchen, you're used to where things are you, you're used to how things are done. You don't have to run around searching for things because you know exactly what you're looking for, where to go. You've got the team that you're used to working with that ... working in a kitchen, it's kind of like being in a ballet. There's a little dance that you do in your movements and where you go and who you're dancing with, and so you don't have that sort of flow in a different kitchen. It's always challenging. We've done dinners in some of the nicest kitchens in the country and it's difficult to even in those. Yeah, it's a challenge, but it's also really fun. It's really fun to see how other people experience your food and their reaction to it and especially working with cooks, how they react to your food or the questions they have. It's fun. It's challenging, but it's fun. Suzy Chase: You learned your techniques and flavors working at some of the best restaurants in the United States. Where did you and your husband, Evan, hone your skills? Sarah Rich: We definitely, like you said, we worked in some really great restaurants here in New York and then also out in California, and that's where you really, for sure, learn those basic techniques that you need to master how to be a good cook. Then when you ... we opened our restaurant. You sort of draw from those experiences and you draw from things that you've learned in terms of flavor and texture and how to put a dish together, and then you just sort of have to break free from just doing what you're comfortable with and start to kind of develop your own perspective. I guess what I mean is, when we first opened Rich Table and we were definitely drawing from all the places we've worked. Even, for example, the buttermilk poached chicken. That was a technique that we learned at Bouley, we brought it over to Rich Table. And then, years later, you sort of evolve and start really putting your own solid perspective into things. Suzy Chase: One thing I hate about fine dining is that you have to dress up. When my husband and I want to eat out in New York City, we don't want to dress up like it's prom. I'm so happy to see that you embrace a casual atmosphere with sort of fine dining level food. Sarah Rich: Right. Yeah. That is also very important to us. I mean we have the same experience and the same feeling. In fact, being back in the city, we've been eating around town and we notice that. We leave our hotel room and we're wearing jeans and a tank top and some sandals, and let's go in anywhere in San Francisco wouldn't be a problem, but here you walk in and you're like, "Oh my gosh, I'm clearly the least properly dressed person in this restaurant.". It is kind of, on one level, just sort of a California mentality. But it's also true that we don't like dressing up. Evan hates it more than anything. He just wants to be able to go as is, a button down or whatever, but feel ... he doesn't like that feeling of feeling uncomfortable when you walk into a space, and so we don't want our guests to feel that way either. We worked in so many restaurants where our friends want to come visit us, but they feel awkward, so they don't. We want ... It was really important to us to create a space where everybody felt welcome and Rich Table is like that. It can be an event kind of dinner. You can get dressed up. You can go to the opera, wear your nice dress, wear your nice suit, stop at Rich Table, have a meal, but you can also just go into the movies that night or maybe you just want to hang out at dinner and there is no dress code. Suzy Chase: I love that. In the cookbook you wrote, "We choose ingredients and put them together based on our understanding of what makes your pallets sing.". A couple of ingredients you love, are gelatin sheets, Douglas fir powder, isomalt, and pop sorghum. Describe a few of these. Sarah Rich: Yeah. That is an interesting grouping. Yes, we do use all of those things. Douglas fir is something that we really started using when we were doing ... Before we had opened Rich Table, we started doing popups, and we were trying to figure out menus and we would take these hikes through Marin and specifically, actually one of the first hikes we ever took was when Evan was ... he was interviewing for the chef de cuisine position at a restaurant called Quince, which is one of the best restaurants in San Francisco. At this point it has three Michelin stars, four star restaurant in the chronicle, it's a fantastic restaurant. He was trying to think of dishes to put together and we're wandering through hiking Mount Tamalpais and there are all these Douglas fir trees around and they've got their fresh springs shoots with these little tiny soft feathery green shoots.And we're picking those off and smelling them. Evan was like, "I think I'll use this in something. ", and put together a dish and ended up getting the job, and was there for about a year. That's how we sort of discovered this flavor of Douglas fir, and so we started incorporating it into our dishes in our popups, and then later when we opened Rich Table. It's just something that ... it's just so California. It's just, to us, the flavor, the smell, all of those things just are very so much a part of our experience in California and so we love it. We use it in our bread, we use it in cocktails, I've used it in a desert, and it's ... a little bit goes a long way. You don't want the food to taste like a Christmas tree, but just that little essence of like tiny, citrusy quality is really nice. Then isomalt. We make lot of little tuiles, kind of like a cookie, crackery sort of thing. Very crunchy. Isomalt is a ... it's kind of like a type of sugar where it has the qualities of sugar when you cook it, so you can get that brittleness, but it doesn't have all of the sweetness. It's really useful in ... if you're making a savory tuile. You want it to sort of shatter like glass, like you could do if you made caramel, but it doesn't have that sweetness. The gelatin, we use to give body to things or to set things like panna cotta. And then, what was the other one? Sarah Rich: Oh, popped sorghum. Oh, that's a great one. Popped sorghum .... sorghum is a grain and it gets used ... a grass seed, sorry. It gets used a lot of times as a syrup in the south, but it also ... it's like a little tiny seed. You can actually buy the seeds online really easily at this point, and we pop it just like you pop popcorn. We get oil really hot, throw the seeds in and they pop just like tiny ... they really ... they look exactly like tiny, tiny popcorn. And so it's a fun little way to add a little texture. I keep coming back to that because the texture is just so important to us in our food. So it's a little crunch. It's actually a little bit nuttier than popcorn. It's really fun. Everybody who sees it is like, "Oh my God, tiny popcorn. ", and I make it for my kids sometimes. I'll take it back home and just pop it. They love to see tiny popcorn. We've used it all over the place. Suzy Chase: Did you know there's a region in China, and they eat things just for the texture? Sarah Rich: I believe it. Suzy Chase: They prioritize the texture over the flavor. Sarah Rich: Yeah, yeah, for sure. It's a really important part of the enjoyment of the food, I think. Suzy Chase: You also wrote in the cookbook, "You have to understand, to a girl from a small southern town, there's this fascination with New York City. It's where life happens.". And I thought the very same thing growing up in Kansas, and now I live in New York City. What was it like for you coming to the big city to go to the French Culinary Institute? Sarah Rich: Oh, it was amazing. It was like a ... I don't want to say a dream come true because that sounds so cheesy, but it was a ... I never would have thought that I would have done that. I'm a pretty ... I was saying this to somebody the other day. I'm a pretty shy kind of quiet person and not super brave about things like that, and I don't think it was something that anybody would have expected of me. There were plenty of people, when I told them I was moving to New York, they laughed at me and they said, "You'll never make it. That city's gonna eat you up. ", and it was really fulfilling a dream. It really was. We used to watch these movies. Like I say in the book, Working Girl, and Melanie Griffith is on the Staten Island ferry looking into Manhattan, and it just seemed like such a vibrant, exciting place where you could make anything happen. And it was that. That's exactly what it was for me. I remember moving to the city, I lived in Hoboken at the time and was going to the French Culinary Institute in Soho and it was so exciting to take the path train and walk from the World Trade Center up to Soho. I tried to walk as much as I wanted to or could so I could see everything. Working down in Tribeca, later at Bouley. It was amazing. It was everything that I wanted it to be. Suzy Chase: I just posted something on Instagram telling about how I grew up in Prairie Village, Kansas and I would stay up late watching Saturday Night Live every weekend, and just the intro, I was like, everyone's asleep in Prairie Village, but everyone's out in New York City and was like, I'm missing something. Sarah Rich: Yes, exactly. People will sometimes have a young cook in their twenties or even early thirties, and they say, "Hey, I'm thinking about maybe moving to New York City for a while, what do you think?. ", and I always say, "Do it. Do it now. Do it. Absolutely.". Because there's a point where you won't. There's a point where your life will have moved past the point where you're willing to take that leap. I 100% always encourage people to do it if it's something they want to do. Suzy Chase: Since your food is so unique, I can only imagine Rich Table, your restaurant in San Francisco, is too. Describe the space. Sarah Rich: It's actually a really lovely space. It's a corner restaurant and we have these huge windows that go floor to ceiling almost. It lets in the most wonderful lights. When ever we do photo shoots, the photographer is always just beside themselves with how great the lighting is. They almost never have to do any sort of tweaking. It's really warm and really just light and really nice. It's funny, when we first found the space, there were a number of people that were like, I don't know why you chose that space, because it's a little bit off from the main area of Hayes Valley and a little bit closer to the mission. But now people who are ... they want to know how did we find it? It's such an amazing space. They're a little jealous. But it's a corner space with big windows. You walk in and there's the host stand right there. A nice long bar over to your right, and then we've got an open kitchen. On the other side of the bar is where the pass is, where the chef stands and all the line cooks and the sous chefs are there on the hotline, cooking the food, passing it over to the chef. The service are coming up, picking up the food, taking it to tables. It's very vibrant and you feel that sort of energy throughout the entire space. We've got a banquette along one wall with long boards that go up to the ceiling that were from an old barn up in Petaluma. They were salvaged, and so those line the walls. Yeah. That's Rich Table. Suzy Chase: Now to my new segment called my last meal. If you had to place an order for your last supper on earth, what would it be? Sarah Rich: Oh, it's so easy. It would be a grilled steak with a fully loaded baked potato. Suzy Chase: Wow, that was fast. People are usually like, "Hmm.". Sarah Rich: No. You know what? Normally I would be. Normally, I'm terrible at answering questions like that because it's like, I don't know. I like this. I like that. What would it really be? But the last couple of times I have made myself a steak and a baked potato, I have thought this is just it. This is my last meal. Now I just know, that's it. There are many things to love. There are many meals to be had. There are many things that would satisfy me, but I really just think that's it. Suzy Chase: Where can we find you on the web, Social Media, and in San Francisco? Sarah Rich: We are found on Instagram @RichTable. It's just that simple. I am Sally Hurricane and Rich Table is located at 199 Gough Street, in San Francisco. Suzy Chase: And what's your website? 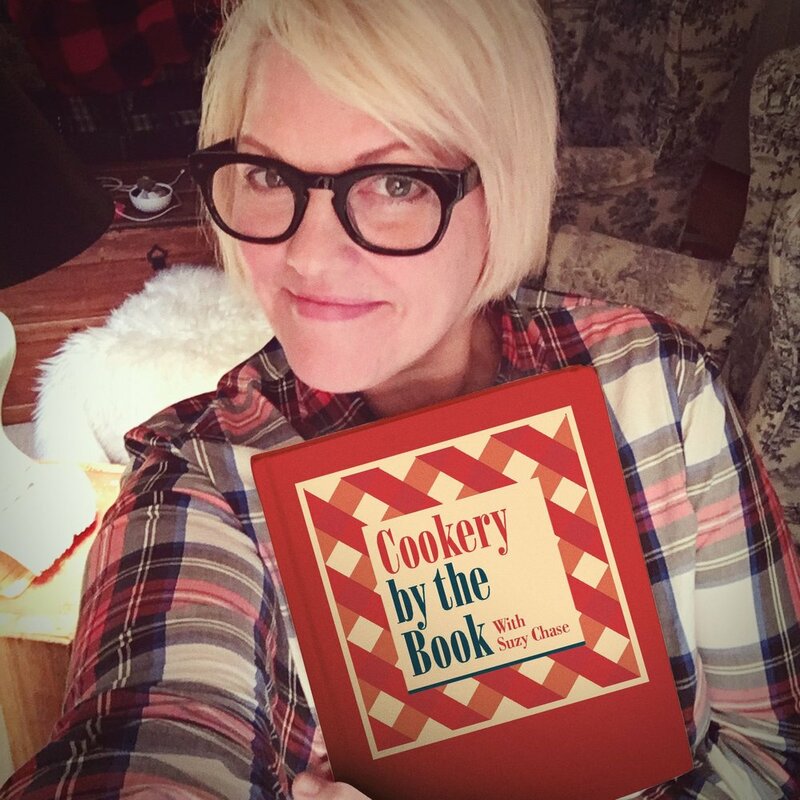 Suzy Chase: It was so nice to meet you in person and taste food out of this glorious cookbook, and thanks for coming on cookery by the book podcast. Sarah Rich: Well, thank you so much for having me. It was fun talking to you. Suzy Chase: Subscribe in Apple podcasts, and while you're there, please take a moment to rate and review Cookery by the Book. You can also follow me on Instagram @CookerybytheBook. Twitter is IamSuzyChase and download your Kitchen Mix Tapes music to cook by, on Spotify at Cookery by the Book. Thanks for listening.